As the Reels Turn 3 is the latest instalment of this popular slots series from Rival Gaming. This version is entitled ‘Blinded by Love’ and continues the tale of Matt Gray, the general manager of the Casino El Paradiso and his companions. Whereas the first two instalments of the game were very similar, this game takes a slightly different approach, with less bonus features, but the chance of increased winnings in these rounds. In this review I look at all aspects of the slot. I start by explaining the basic features of the game and the standard wins on offer. I then delve into the bonus features, with a full explanation of the ‘Ivan the Fish’ and the ‘Advance to Next Scene’ bonuses. 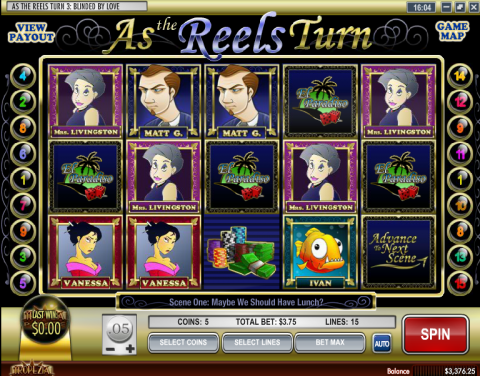 I finish with a look at the iSlots range and an overview of the ‘As the Reels Turn 3” slot. This game has many aspects to it, including the evolving storyline and the many featured characters, but behind all this it’s a standard 5 reel, 15 win line slot. As with the previous versions of the game, the top symbols are the ‘El Paradiso’ and the ‘Chips and Cash’ symbols. Unlike in version 2, Danny is now a standard character/symbol and joins Jamie and Mrs. Livingston on the second rung of winning symbols. Lastly, you’ll find Matt G, The Don and Vanessa on the bottom rung, offering the lowest winning amounts. In addition to these characters, you’ll also find ‘Ivan the Fish’, ‘Pampers’ and ‘Advance to Next Scene’, who are all involved in the bonus features. Ivan the Fish – If you manage to hit Ivan three times across all the reels this bonus feature will be activated. The Ivan the Fish bonus gives you 10 free spins, and also activates Pampers, which I assume is a cat, but has the facial features of a dog. Pampers the cat/dog only appears in this bonus round, and if hit will expand to take up the entire reel. This is a bonus as Pampers is also Wild, meaning you’ll have a whole reel of wilds. Additionally, Pampers the Cat/Dog has a 3x multiplier if appearing and a 4x multiplier if appearing twice. Advance to Next Scene – When this symbol appears three times across all three reels, you’ll activate the bonus round. This starts with a ‘Danny Costumes’ bonus game, where you’ll choose an item of clothing for Danny to wear by hitting ‘Stop’ on a chest of drawers where the drawers are rapidly opening and closing. He’ll then wear the clothing to impress Jamie – although it might impress you more as you’ll gain a cash bonus based on the outfit you choose. You’ll then be taken to the next scene on the game ‘map’, a short animation where you’ll be able to enjoy the latest in the ever evolving storyline. The first scene features a rather interesting tennis match, where Danny gets more than he bargained for, but being a soap opera, I’m not going to give away the ending. Each time you hit this bonus round, you’ll have access to another scene. The ‘As the Reels Turn’ series is part of the iSlots range offered by Rival casino software. These games have been developed with the purpose of featuring an ever evolving storyline with interactive features – an ideal recipe for series of games like this one. All iSlots games are available on both a PC and a Mac and can be played in a browser or through a download version. You’ll also be able to play a selection of iSlots games on the go, as the mobile versions are developed using HTML 5, making the games ideal for both the iPad and Android devices. Having played all three versions of the game, I’ll admit to being a little bit disappointed with this version in comparison to the other two. This is mainly because the bonus features have been cut in half; so much more of the gameplay is based around the standard reels. However, when hitting a bonus round, you’ll potentially make more money in this version – and this might be preferable to many players. The game still has that great sense of humor, and is very playable and I’d be somewhat surprised if number four isn’t in the works already.